In mid-January, a week before Donald Trump was sworn in as President, we asked what might happen to the Affordable Care Act (ACA), known colloquially as “Obamacare.” At that time the Republican-controlled Senate voted 51-48 to begin dismantling the legislation and, despite a stinging setback for Trump in late March, the repeal of the ACA now appears to be back on track. There is irony in this development because research just published credits the ACA with earlier breast cancer diagnoses, benefiting poor women who were now able to afford screening. Abigail Silva and colleagues from Chicago published their findings in Cancer Epidemiology and showed the shift to stage I breast cancer diagnoses was greatest among Latina and African American women. One of the benefits of the ACA was that it eliminated co-payments and other out-of-pocket expenses for 45 preventive service provisions, of which breast cancer screening was one. Utilizing the National Cancer Database, the researchers analyzed 470,465 breast cancer patients aged between 50 and 74, examining separate time periods: the two years before and after the ACA came into effect. They asked two questions: (1) Has there been a shift in breast cancer stage before and after implementation of preventive services provision (PSP)? 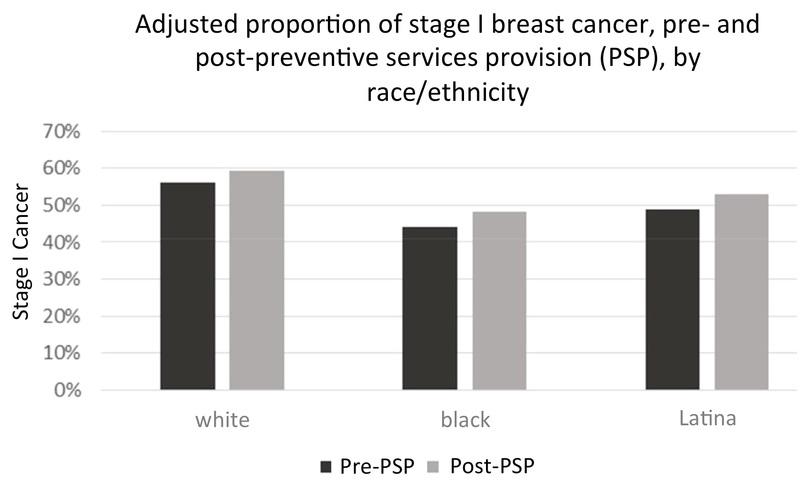 (2) Was there any impact of PSP on cancer stage when considering racial or ethnic disparities? On average, the number of breast cancers diagnosed at stage I increased by 3.6%, from 54.4% to 58.0%. Click on the figure above (© Cancer Epidemiology) to see how the shift towards stage I cancers increased by 3.2% for white women, 4.0% for black women, and 4.1% among Latinas. There was simultaneously a reduction in stage II and stage III diagnoses, while the percentage of stage IV cancers was unchanged. The Affordable Care Act, although it has been much maligned – at least by many in the Republican Party – would appear to offer important benefits for the most vulnerable women while also saving tax-payer dollars for expensive treatment. The nonpartisan Congressional Budget Office predicts 22 million Americans will lose their insurance by 2026 if the current Senate bill were to be passed. Let’s hope that does not happen. Another argument for health insurance and breast Screening including Ultrasound. The world is going forwards..including the United States. But actual president TRUMP seems to be ignorant, concerning differentiated Questions of life, medical health, global politics, climate problems, global economy etc.